This is the 25 year story of Mugenkyo, from the first fateful meeting with Masaaki Kuramaya Sensei, when founders Neil Mackie and Miyuki Williams first travelled to Fukui in 1992, to the highs and lows, the pain and the joy of establishing and developing Europe's first professional taiko group, blazing a new trail. 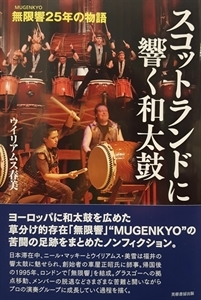 Since the group was born in 1994, Mugenkyo have performed thousands of concerts, reaching millions of people worldwide and taught many hundreds of taiko workshops, inspiring many others to follow the taiko path. Their dedication to the art-form has kick-started the transformation of a barren taiko landscape into a blossoming taiko scene in the UK that grows year by year. Full of anecdotes and insights, this book will take you behind the scenes of the hardest-gigging taiko band in the western hemisphere. The author, Harumi Williams, is an established travel writer, having published books on India, Bhutan, Burma, Vietnam, Laos and Cambodia. She is currently working on her next book Scotland, the people and its history.